The second coming of the Wagram game is on this coming weekend – 5 & 6 August 2017 – at the Call to Arms convention in Wellington, New Zealand. This iteration will be played over two days with an expanded battlefield / tabletop, a few more players, a few more troops and a few tweaks to the game itself. von Peter himself is expecting a more torrid time than the cake walk the French gave him in the first game. Sob! Pictures of the newly pigmented figures in a later post when some photos are taken. THE POLISH LEGIONS 1798-1814 Was originally published in 1974 and was on of the earlier r titles in the ‘Armies and Uniforms’ series of books written by W. J. Rawkins. This new E-book edition has been substantially revised and updated with a wealth of new material which was not available or was incomplete in when originally released. The original black and white line drawings have been replaced with new illustrations in full colour and the volume now contains many illustrations from contemporary or authoritive sources. The Dear reader may be aware that von Peter himself is a huge fan of The History Book Man’s e-books. Still £3.99 and still an e-book bargain. This new scenario book arrived reasonably promptly. It’s full colour on glossy paper and though von Peter himself has only had a quick skim read the scenarios themselves seem to be of interest. Unfortunately the skim read quickly betrayed the fact that the book was written in Italy – by the good folks of the Milan Wargames Club. Of course this of itself is not a bad thing but what is a bad thing is not having the English version properly edited. The text at times betrays its non English origins and the maps have not been translated from Italian to English at all. None of this means that the scenarios will not provide good games but it is a shame. And none of this means that von Peter himself wont pore over the contents of the book … but it is a shame. What’s life without a little frivolity? Dice of War make a range of … surprise … dice such that one can have dice to match one’s army. They do this by making the dice in a colour suitable for the army and by replacing the spots on the ‘6’ face with a graphic appropriate to the army. von Peter himself has started an assault on the Napoleonic Dice range. All of a sudden it seems to be a fantastic idea to have matching dice for each of the armies collected. The Austrian dice were to be the first purchased for use in the Wagram games but agents of the cursed French have obviously infiltrated the supply chain and these were out of stock … as fyi are the Russian dice. D’oh! A fall back nation was required for the first ‘trial’ purchase. Obviously it had to be the Prussian dice but this was not so straight forward. Two varieties of Prussian dice are on offer. One has an iron cross shape and the other a Prussian Eagle. von Peter himself chose the cross as it is more immediately obvious as to the nation – ok, it could be generic German dice but lets not get too picky! – and several other nations have a variety of eagles so staying away from an eagle seemed like a good idea. A second order has been placed for a couple of sets of French Dice – one for von Peter himself and one for Garage Gaming Terry – and a set of the newly released Saxon Dice. Once again the French Dice come in two varieties – one with a ‘N’ surrounded by a laurel wreath and one with a French Eagle. We are getting the ‘N’ dice. As before, and thanks to our gracious sponsors, we have quite a few prizes to be won. Leave your email address at the end of the survey to be entered into the raffle. Entering the contest does not automatically mean we’ll subscribe you to any communication. That is a separate question which does not influence the raffle in any way. As a thank-you for taking part, everyone who completes the survey will get a €5 gift code for the Wargames, Soldiers & Strategy / Karwansaray Publishers webshop. Though it does not apply to shipping costs, this code can be used for any (combination of) item(s) in the shop apart from our Premium and Digital subscriptions. This entry was posted in General de Brigade, Social activities, Web life by von Peter himself. Bookmark the permalink. 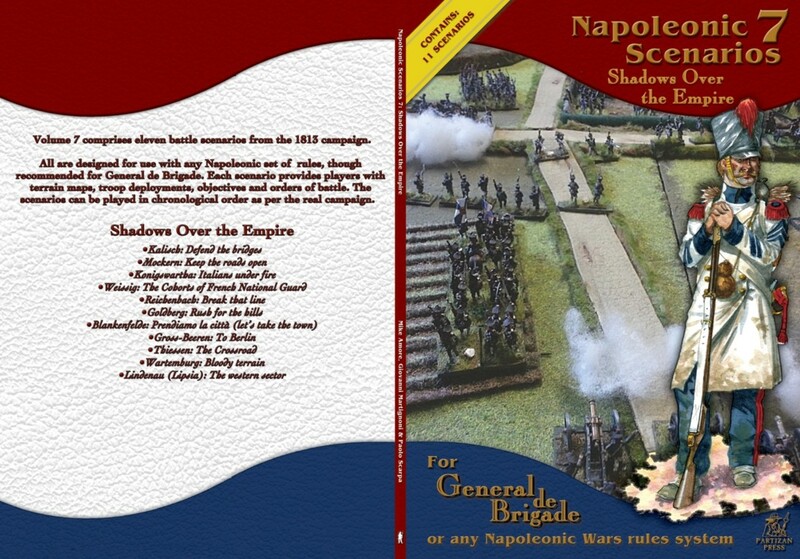 Does the Napoleonic Scenarios 7 book say what unit/nationality is the figure on the cover? My apologies but I can’t find any caption for the unit/nationality of the figure on the cover … or for any of the other uniforms illustrated in the book. Unfortunately all of the other illustrations are much more readily identifiable than this one. Dratts!! The other uniform plates in the book can all be linked with the scenario they are printed with. The cover figure is reproduced on page 8 at the end of the “Battle of Kalisch February 13th 1813″ scenario. The infantry of the French side in the scenario contains mostly Saxons supported by some French, Poles & two battalions of infantry from Wurzburg. He’s not a Saxon and to my knowledge the Wurzburgers wore white faced red. So scratch those two nations. That leaves French & Polish – assuming that the figure does indeed represent a combatant from the Kalisch scenario. My vote/guess/hope is that the figure represents a Pole. That falling plume reminds me a little of the falling plumes that Front Rank have sculpted on to their uhlans – see the trumpeter in the prior post https://vonpeterhimself.wordpress.com/2018/12/26/send-for-the-2nd-uhlans/. The double stripe on the outer seem of the leggings also strikes me as a Polish thing to do – see that uhlan trumpeter again! At least three Polish infantry regiments that were in Spain pre 1812 were issued French kit which included French bell topped shakos. But in the end I don’t know. Sorry.